Ask Amanda: Is It Ever Safe to Go Back? Home Articles Ask Amanda Ask Amanda: Is It Ever Safe to Go Back? An abuser promises things will be different this time. Can this ever be true? This is a situation that happens a lot. It can be confusing on so many levels, not only for you but those around you as well. What people on the outside of abuse may not remember is that an abusive partner was also once a person the survivor used to care about, possibly someone they were in love with. Often times, there is the temptation to return to those “good” times with hope that things have changed for good. I talked to Alesha Durfee, professor of Women and Gender Studies at Arizona State University and an expert in social policy, domestic violence and civil protection, and asked her to weigh in. She’s also a former volunteer victim advocate with the Seattle Police Department. “Often, I find survivors are the most caring, loving, giving people, and that’s why they consider going back. These relationships [with an abusive partner] are often based on love. An abuser can escalate these feelings of love to get someone back,” says Durfee. You, the survivor, are always the expert in your own situation. Only you can take control of your life and choose what is best for you. You can choose to go back and you can choose to leave again. The thing that’s most important, Anon, is that whatever decision you make, you should never give up safety planning. Don’t let your guard down—prepare for the possibility that you will need to reactivate an escape plan, that he may not have changed and that he or she could fall back into abusive patterns. To create a safety plan, read, “Customizing Your Safety Plan,” and, if applicable, “Safety Planning With Kids.” There are a wide number of other safety planning topics found in our Safety Planning section. Wouldn’t it be nice if there was a foolproof list of things one could check off to assure that it was safe to return to a previously abusive partner? “I wish there was a list, but we only deal with probabilities,” Durfee says. No list is all-encompassing or perfect, but the list in “Can Abusers Change?” is a start. An abusive partner may present promises of change, even offer up proof of this change—he or she has gone to counseling, or a batterer intervention program. He or she has gone to rehab or attends Alcoholics Anonymous meetings (even though we know that alcoholism is not the cause of domestic violence). But what Durfee says survivors should pay attention to are the little things: Do you notice behaviors in day-to-day interactions that are different than the past? For instance, suggests Durfee, if they get in the wrong line at the grocery store, are they muttering obscenities under their breath or lashing out at the cashier, or do they handle it calmly? How are they talking to you, the children, your children’s teachers, servers at a restaurant? Are they calm and respectful or does it remind you of the past, when you felt like things were always on the brink of escalating? The hard truth is that recidivism, or the chance that an offender will commit a crime again, is a very probable outcome. In this study out of the Bronx Misdemeanor Domestic Violence Court, researchers found that out of 1,300 cases of domestic violence, 8 percent of domestic violence defendants were arrested again between their case disposition and initial arrest. Repeat offenses became much more common as more time passed: 35 percent of offenders were rearrested during their batterer intervention program mandate period, 31 percent within the year following the end of their program mandate and 44 percent within the two years following the mandate. Between the times that offenders were initially arrested to two years following their release, a staggering 62 percent of all defendants involved were rearrested. If you haven’t already, please consider reading The Gift of Fear by Gavin de Becker, which talks all about trusting your gut instincts about people and situations. Remember this, says de Becker’s senior advisor Bob Martin: Don’t take unrelenting persistence as a compliment. If you need to time to think about a possible reconciliation, want to take it slow, or give a flat-out “no” response, and your ex-partner persists and pushes forward, he doesn’t have respect for your boundaries. This should be an immediate, and possibly glowing, red flag. Have a question for Ask Amanda? Message us on Facebook, Twitter or email AskAmanda@DomesticShelters.org. Ask Amanda is meant to offer helpful resources and information about domestic violence. 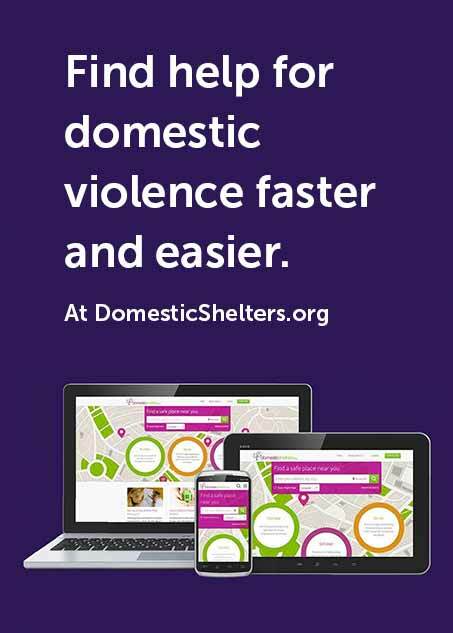 If in crisis, please reach out to your nearest domestic violence shelter for the guidance of a trained advocate. Ask Amanda: How Do I Get Into a Shelter? Ask Amanda: What if Your Landlord is Abusive? Ask Amanda: Can I Visit a Food Bank? Ask Amanda: What Happens If Shelter Is Worse Than Home?